Taste (gustation) and smell (olfaction) are called chemical senses because both have sensory receptors that respond to molecules in the food we eat or in the air we breathe. There is a pronounced interaction between our chemical senses. For example, when we describe the flavor of a given food, we are really referring to both gustatory and olfactory properties of the food working in combination. You have learned since elementary school that there are four basic groupings of taste: sweet, salty, sour, and bitter. Research demonstrates, however, that we have at least six taste groupings. Umami is our fifth taste. Umami is actually a Japanese word that roughly translates to yummy, and it is associated with a taste for monosodium glutamate (Kinnamon & Vandenbeuch, 2009). There is also a growing body of experimental evidence suggesting that we possess a taste for the fatty content of a given food (Mizushige, Inoue, & Fushiki, 2007). Molecules from the food and beverages we consume dissolve in our saliva and interact with taste receptors on our tongue and in our mouth and throat. Taste buds are formed by groupings of taste receptor cells with hair-like extensions that protrude into the central pore of the taste bud. Taste buds have a life cycle of ten days to two weeks, so even destroying some by burning your tongue won’t have any long-term effect; they just grow right back. Taste molecules bind to receptors on this extension and cause chemical changes within the sensory cell that result in neural impulses being transmitted to the brain via different nerves, depending on where the receptor is located. Taste information is transmitted to the medulla, thalamus, and limbic system, and to the gustatory cortex, which is tucked underneath the overlap between the frontal and temporal lobes (Maffei, Haley, & Fontanini, 2012; Roper, 2013). 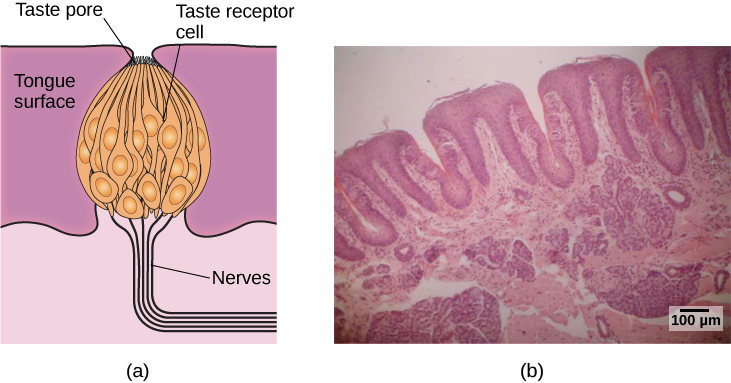 Olfactory receptor cells are located in a mucous membrane at the top of the nose. Small hair-like extensions from these receptors serve as the sites for odor molecules dissolved in the mucus to interact with chemical receptors located on these extensions. Once an odor molecule has bound a given receptor, chemical changes within the cell result in signals being sent to the olfactory bulb: a bulb-like structure at the tip of the frontal lobe where the olfactory nerves begin. From the olfactory bulb, information is sent to regions of the limbic system and to the primary olfactory cortex, which is located very near the gustatory cortex (Lodovichi & Belluscio, 2012; Spors et al., 2013). 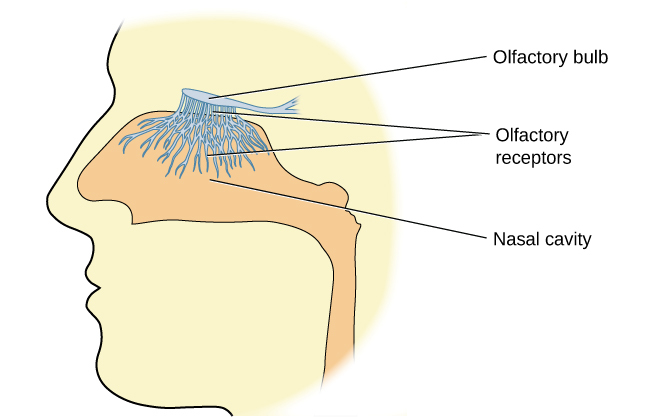 Olfactory receptors are the hair-like parts that extend from the olfactory bulb into the mucous membrane of the nasal cavity. There is tremendous variation in the sensitivity of the olfactory systems of different species. We often think of dogs as having far superior olfactory systems than our own, and indeed, dogs can do some remarkable things with their noses. There is some evidence to suggest that dogs can “smell” dangerous drops in blood glucose levels as well as cancerous tumors (Wells, 2010). Dogs’ extraordinary olfactory abilities may be due to the increased number of functional genes for olfactory receptors (between 800 and 1200), compared to the fewer than 400 observed in humans and other primates (Niimura & Nei, 2007). Many species respond to chemical messages, known as pheromones, sent by another individual (Wysocki & Preti, 2004). Pheromonal communication often involves providing information about the reproductive status of a potential mate. So, for example, when a female rat is ready to mate, she secretes pheromonal signals that draw attention from nearby male rats. Pheromonal activation is actually an important component in eliciting sexual behavior in the male rat (Furlow, 1996, 2012; Purvis & Haynes, 1972; Sachs, 1997). There has also been a good deal of research (and controversy) about pheromones in humans (Comfort, 1971; Russell, 1976; Wolfgang-Kimball, 1992; Weller, 1998). A number of receptors are distributed throughout the skin to respond to various touch-related stimuli. These receptors include Meissner’s corpuscles, Pacinian corpuscles, Merkel’s disks, and Ruffini corpuscles. Meissner’s corpuscles respond to pressure and lower frequency vibrations, and Pacinian corpuscles detect transient pressure and higher frequency vibrations. 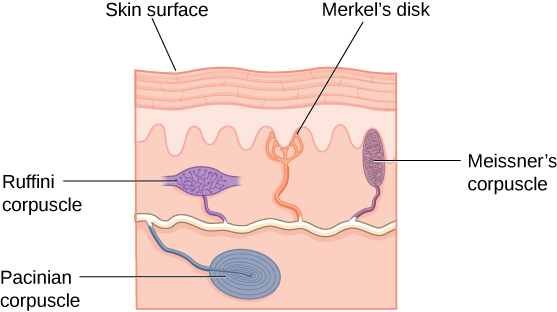 Merkel’s disks respond to light pressure, while Ruffini corpuscles detect stretch (Abraira & Ginty, 2013). There are many types of sensory receptors located in the skin, each attuned to specific touch-related stimuli. In addition to the receptors located in the skin, there are also a number of free nerve endings that serve sensory functions. These nerve endings respond to a variety of different types of touch-related stimuli and serve as sensory receptors for both thermoception (temperature perception) and nociception (a signal indicating potential harm and maybe pain) (Garland, 2012; Petho & Reeh, 2012; Spray, 1986). Sensory information collected from the receptors and free nerve endings travels up the spinal cord and is transmitted to regions of the medulla, thalamus, and ultimately to somatosensory cortex, which is located in the postcentral gyrus of the parietal lobe. Pain is an unpleasant experience that involves both physical and psychological components. Feeling pain is quite adaptive because it makes us aware of an injury, and it motivates us to remove ourselves from the cause of that injury. In addition, pain also makes us less likely to suffer additional injury because we will be gentler with our injured body parts. Generally speaking, pain can be considered to be neuropathic or inflammatory in nature. Pain that signals some type of tissue damage is known as inflammatory pain. In some situations, pain results from damage to neurons of either the peripheral or central nervous system. As a result, pain signals that are sent to the brain get exaggerated. This type of pain is known as neuropathic pain. Multiple treatment options for pain relief range from relaxation therapy to the use of analgesic medications to deep brain stimulation. The most effective treatment option for a given individual will depend on a number of considerations, including the severity and persistence of the pain and any medical/psychological conditions. Some individuals are born without the ability to feel pain. This very rare genetic disorder is known as congenital insensitivity to pain (or congenital analgesia). While those with congenital analgesia can detect differences in temperature and pressure, they cannot experience pain. As a result, they often suffer significant injuries. Young children have serious mouth and tongue injuries because they have bitten themselves repeatedly. Not surprisingly, individuals suffering from this disorder have much shorter life expectancies due to their injuries and secondary infections of injured sites (U.S. National Library of Medicine, 2013). The vestibular sense contributes to our ability to maintain balance and body posture. 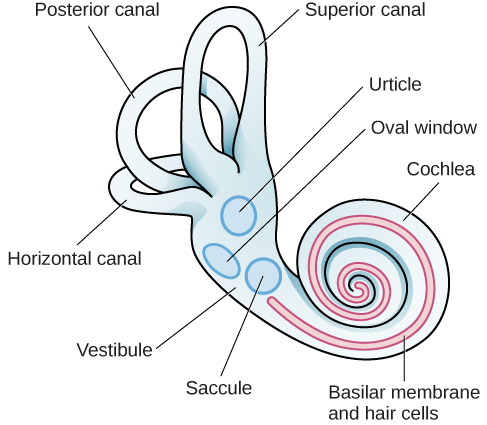 As the following Figure shows, the major sensory organs (utricle, saccule, and the three semicircular canals) of this system are located next to the cochlea in the inner ear. The vestibular organs are fluid-filled and have hair cells, similar to the ones found in the auditory system, which respond to movement of the head and gravitational forces. When these hair cells are stimulated, they send signals to the brain via the vestibular nerve. Although we may not be consciously aware of our vestibular system’s sensory information under normal circumstances, its importance is apparent when we experience motion sickness and/or dizziness related to infections of the inner ear (Khan & Chang, 2013). The major sensory organs of the vestibular system are located next to the cochlea in the inner ear. These include the utricle, saccule, and the three semicircular canals (posterior, superior, and horizontal). In addition to maintaining balance, the vestibular system collects information critical for controlling movement and the reflexes that move various parts of our bodies to compensate for changes in body position. Therefore, both proprioception (perception of body position) and kinesthesia (perception of the body’s movement through space) interact with information provided by the vestibular system. These sensory systems also gather information from receptors that respond to stretch and tension in muscles, joints, skin, and tendons (Lackner & DiZio, 2005; Proske, 2006; Proske & Gandevia, 2012). Proprioceptive and kinesthetic information travels to the brain via the spinal column. Several cortical regions in addition to the cerebellum receive information from and send information to the sensory organs of the proprioceptive and kinesthetic systems. The Other Senses by Rajiv Jhangiani, Ph.D. is licensed under a Creative Commons Attribution 4.0 International License, except where otherwise noted.